« Poetry Friday: I’m Going as a Witch This Year. Jules: Welcome to our weekly meeting ground for taking some time to reflect on Seven(ish) Exceptionally Fabulous, Beautiful, Interesting, Hilarious, or Otherwise Positive Noteworthy Things from the past week—whether book-related or not—that happened to you. That exuberant illustration, opening our post here, is from illustrator and graphic artist Nicole Tadgell’s most recently-illustrated title, No Mush Today, written by Sally Derby (Lee & Low Books, September ’08). Nicole recently launched her blog tour for this title; she’s been to visit Kelly at Big A little a and Lori Calabrese (who has a wonderful interview in which she asked Nicole about her medium and work space, and Lori displays a nifty Photobucket slide show thingy of Nicole’s process). 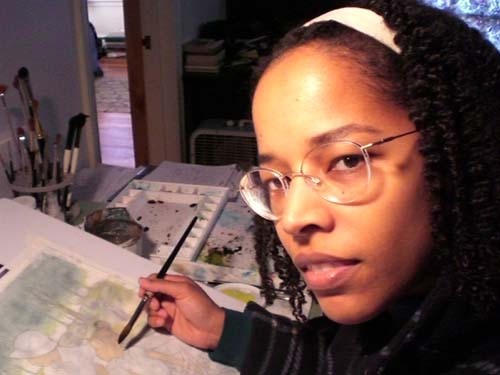 We’re glad Nicole agreed to stop by here this Sunday to share some art work from the book. Jama Rattigan also did a wonderful feature of the book here in September. I’m excited about the release of my newest book, No Mush Today! It’s my first book with Lee and Low, and I have wanted to work with them for a long time, hopefully there will be many more. This story was both fun and challenging to illustrate. I think what I really like best about this story (and the project itself) is that it’s a “slice of life” kind of story. Being an illustrator of multicultural books, I find I really enjoy warm, family-centered stories that many kids can relate to. Primarily, I draw kids of African-American descent, but I am really looking forward to working on books featuring kids of all races. I have plenty of stories in my head, and I’m slowly learning how to pry them out! Writing seems like a daunting challenge – the more I learn about it, the more my respect for writers grows! The first girl, Maggie, was adorable and I already knew her since she was a baby. We had a tea party one day, and she got all dressed up (I asked her mom to let her dress herself –- that’s where the plaid skirt and striped tights came from) and Ducky was a guest, too…When Lee and Low asked how old the girl was, they felt that four was too young for this book. Even though Maggie was tall for her age, I had to find a model who was really six! So I found Sharaya. I didn’t know her well, and it turns out she was just as shy as I am! But it worked out fine. The hairstyle, facial features, and sweater were hers. Other fun tidbits: I used local places for the scenery. Two churches in Worcester, Elm Park for the swings. My mother gracefully posed as the grandmother, and my husband stood in for the daddy in those shots. The character of Daddy was another model. I love hats! That was one of the most fun parts, drawing fun hats. Many, many thanks to Nicole for sharing her illustrations and the book with us today. (By the way, she has created coloring pages for the book for anyone interested in using them for classroom or library use; they’re here at the Lee & Low site.) Maybe we’ll see Nonie again in future books; for now, it’s our pleasure to meet her as well as the illustrator who helped bring her to life on the page. 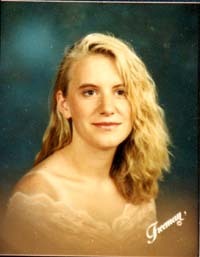 Some of you may know about author Jay Asher’s/The Disco Mermaids’ challenge to writers of YA fiction, writers of children’s lit, and anyone who blogs about such things: “Go dig out your remaining senior photos. If you were just so popular in high school that you don’t have any leftovers, go scan the photo in your yearbook. And then post it on your blog! Come back to this post and leave a comment, directing us to your blog, so we can all laugh at…I mean, admire…how much you haven’t changed.” Many bloggers have risen to the challenge, including some of our regular Sunday kicks-listers. Look at these beautiful people: Sara! Jama! And here are Betsy Bird and Sarah Stevenson! If I missed any regular readers, I apologize. Send me a link, and I’ll amend. 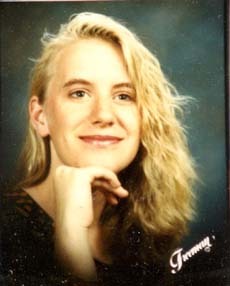 Okay, here are my senior pics, circa 1990-1991. My favorite features are my moody expressions, and the Glamour Shots-style blur… nice. Oh, also: you can’t see it, but I’m pretty sure my jeans are peg-rolled. Anyway, how ’bout some kicks? 1* The husband came home safe and sound from Seoul, with many stories of his adventures in trying to order food in a language he doesn’t speak, and trying to figure out what he was eating when it arrived. 2* This one I’ve been sitting on a while, until I was absolutely sure it was going to happen: he has to go back to South Korea for a couple of weeks around Thanksgiving… and this time, I’m going with him! I get to stay in his company-provided hotel, but I do have to pay for plane fare, and… DANG. Have you guys tried to buy a plane ticket to Asia lately? Kinda pricey. But whatever… when will I have a chance like this again? 3* One reason I’ve been so scarce online lately is that my poor old computer, Roxy, was really making noises like she was about to die. Well, I’ve always been a PC girl, but lately I’d been thinking about going Mac. Then Apple went and unveiled their new line of laptops, and the Cornell Store still had a bunch of the older models, which they put on sale. Seemed like a sign, right? So I got me a new MacBook. I’ve named her Moxie, and I LOVE her. She’s so FAST! And she doesn’t make horrible grinding noises when I open iTunes! And the screen isn’t permanently pee-yellow! Yay! 4* The Poets Upstairs are entertaining Justin’s parents for the week, and I got invited up for delicious homemade pumpkin pie. 5* Crunching through leaves on my walk home to kick up that fabulous fall smell. 6* I saw another new-to-me treasure in our collection at work. The RMC actually has one of the voting machines from Palm Beach County’s 2000 election. Yes, complete with cards that you can punch and get the whole hanging chad effect. I’m telling you, looking at that thing, the whole mess becomes totally clear. I probably would have voted for Pat Buchanan too. 7* For our 9th anniversary, the husband and I checked out an Italian restaurant we haven’t been to yet. Yu-u-u-u-u-m. I wasn’t sure which senior pic to post, but Eisha posted two, so I will. These are from 1990. Maybe only *I* can tell this, but I think it’s pretty clear in both pictures that I really wanted out of high school (those are pretty forced, half-hearted smiles, and in the second one, I just appear flat-out BORED), and I don’t know how it is that a tan line is involved in one and a light perm in both. 2). And Zoe and her family came! I’d post a pic of her and her beautiful baby daughter, but I don’t have her official permission yet and don’t wanna surprise her. Also, they brought my girls gifts, which was too, too kind and ’cause they are lovely, thoughtful people. 4). Elisa Kleven will be at 7-Imp this week, and it’s been such a delight to chat with her and see her new book (more on that later). I’d say she and I are perhaps kindred spirits, except that if I did, I’d just be flattering myself greatly. 6). When I had a really rough afternoon this week with my daughter (the tantrum that never stopped), my husband made me some of those no-bake chocolate/oat cookie thingies that are so good. Just to cheer me up. 7). Coldplay’s performances on “Saturday Night Live” last night, but especially the first one. Senior Jules and eisha! Aw. I won’t be participating because I don’t have senior pictures – not the done-up professional-looking shots – I graduated early – and because I look now pretty much just as I did in high school . . . and, for that matter, middle school. eisha’s husband: Welcome home! Happy anniversary. I hope you two have a safe and happy Thanksgiving trip. eisha: Roxy and Moxie – love the names. Jules: You social butterfly you! 1. Yay, Grad ’91! Woo woo! (love these photos…if our lives had overlapped in an imaginary-time-space-warp-John-Hughes-movie kinda way, I would have had the hugest crush on both of you, but of course kept it entirely secret) This isn’t really a kick, but those photos kick. 2. The Family Vacation was fantastic. We visited the west coast of Vancouver Island, a gorgeous, rugged place that makes me eternally happy. 3. New music! My constant procrastination at work since my vacation has meant lots of new discoveries online — some terrible stuff, some wonderful stuff…but I was in a real rut with music and it’s nice to be out of it. 4. Learning to play the violin with Ivy. So hard…for both of us. 5. An amazing load of new kids’ books arrived from the library, including the second Penderwicks, the second Mysterious Benedict Society, The Sisters Grimm…I know the rest of you read these months ago, but I’m way too excited to finally get my hands on them. 6. Helping a neighbor turn several thousand pounds of apples from his orchard into 400 gallons of juice in four hours…he sent me home with 10 gallons (and as many apples as I could carry) for my trouble, which I mostly canned and froze for the winter. 7. Mondays off work from now until Christmas. I know you saw on my blog that my daughter was chosen as one of NASA’s student ambassadors for the 2009 Year of Astronomy. That kick was enough to kick-ify my entire week. Now everyone cross your fingers that she gets to be one of the two who also get to go to….Paris!!! Yes, for the opening of the year’s celebrations. Wouldn’t that be awesome? As for other kicks, I bought Halloween candy and haven’t broken into the bag yet. I’m watching the HBO John Adams mini-series, and I had the most delicious Salvadorian food with writer friends last night. Hi, Little Willow! I need to try to do one-word kicks one week. Do you think that’s even possible for wordy ‘ol me? …Glad rehearsals are going well. Guess what? I finally got my library copy of Emmet Otter’s Jug-Band Christmas, since you recommended it (but I haven’t read it yet). Jeremy, PLEASE recommend some of the new music you found! I NEED some. And I love that you’re learning to play the violin with your daughter. I want to do that with piano with my girls (one or both, actually — whoever is interested), but I kinda have to have a piano first. And we don’t have the room. Oh, and Jeremy, I’ve not yet read The Sisters Grimm. Let us know if it’s good. ….So glad you had a great vacation with your family. It sounds lovely. Sara! I was totally going to announce your daughter’s news here, ’cause I’m still excited for you, but it’s not really my kick. It’s all yours, and I’m glad you shared it again. As someone who was obsessed with outer space as a child, I hope you keep sharing her astronomy news. How’s that John Adams mini-series? I’m interested in seeing that, too. P.S. Everyone, Nicole posted her senior pic after all. Go here. Thanks, Nicole! The John Adams series is really good. I’m loving the the portrayal of the relationship between John and Abigail—they respect and tease and challenge each other and are just…devoted. It’s lovely. Plus, there’s so much history I’m hazy on—my history education was very, very poor—so I’m hoping it’s all accurate and I’m becoming enlightened at last. Eisha and Jules, love the pics…so serious! Glad your husband got home, Eisha. And no bake chocolate oat thingies, Jules? Yummy! 2. Ordering new appliances for the kitchen. 3. Seeing granddaughters this week, all three. 4. The fall weather has been extraordinary. 5. The movie, Tortilla Soup. Very sweet. 6. Chuck to the books and the check to Doernbecker Hospital Foundation this week and they were appreciative of the donation from the blogging group. 7. A 5th grade teacher thinks I should just work on writing with her class this year and not worry about library skills. While doing a school visit in Hopewell, Va, I stumbled across the Louisiana Love Shack, a fantastic roadside food stand. And the very next day, I got to see The Carolina Chocolate Drops llive and in person. They are fantastic and you really need to see them if they come anywhere near you. Oh wow, there’s so much to be excited about today — LOVE your senior pics! What beauties — those are from the 90’s? You guys are babies (tottering off with my granny cane) . . . wait! Glad your DH got home safely, Eisha, and congrats on acquiring Moxie! Hope you have a good trip to Korea next month. I’ve never been, and I don’t speak Korean, so I’m counting on you for cultural gems. Jules, I’ve been gorging myself on raspberries, too. Any cupcakes left from your party? I didn’t realize Coldplay was on SNL last night. I missed it :(. 1. Nicole’s visit — love the book and all her comments (and her senior pic)! 2. Reading about Thomas Jefferson’s gastronomic adventures. He was as close as a President can come to being a vegetarian, LW! 3. Mr. Donnelly and I had a close encounter! I was driving out onto the street and we both stopped at the same stop sign. He was waiting (like a good citizen), for me to turn before crossing the street. I waved to him and said, “go ahead”! He looked back at me and then crossed the street safely. I’m sure he was working on a secret spy mission. 4. Squirrel convention on our front porch! Caught about 5 squirrels feasting on all our pumpkins. Even though they’ve made a terrible mess, it’s fun watching how they bite the shell, scoop out the seeds and gorge themselves. 5. Received nice thank you notes from my niece and nephew. I’d sent them The Underneath and The True Meaning of Smekday. 6. All the Senioritis pictures out there. 7. Made a Kennedy recipe and it turned out good: Poulet Chasseur. You can’t go wrong cooking with wine. Little Willow, c’mon. Post your pics! Except for being wider and wrinklier, I look about the same too. And except for being happier and un-permed, Jules looks the same as her pics now. Good catch on the duck – that pic of it turning its beak up at the mush is totally funny. Jeremy, you’re too sweet. What are you listening to? Do tell! And how awesome that you’re taking on a new instrument with your daughter. Sara, CONGRATS TO YOUR DAUGHTER!!! My fingers are crossed for Paris. And your photo – gorgeous! Jone – you too, you’re a total babe. Everyone go check out that swoopy thing her hair could do. And I’m glad you’re getting some of this gorgeous weather on your side of the country, too. Sam, with all my heart, I want to experience something called the Louisiana Love Shack. I don’t even care what it is, I’m just in love with the name. And Jules posted something about the Carolina Chocolate Drops months ago, didn’t you, Jules? They sound excellent. jama, your pic made me wish I’d graduated in Hawaii. I mean, leis? That’s awesome! And I sent Mr. Donnelly on that mission, just to pop in on you and say “‘sup?” Mission accomplished. High school pics are hilarious. 7. “Tall” Corduroy pants from the GAP that fit like a dream. Yay for Eisha getting to go to South Korea! Yay for no bake chocolate cookies! 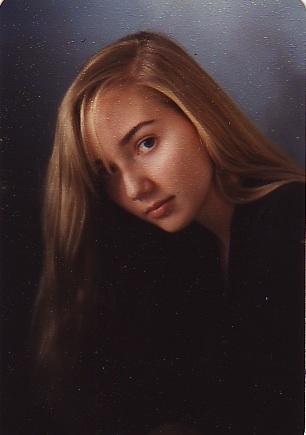 I don’t have any senior photos because I told my mom to throw away all my college and high school year books when she moved across the country, and the dozens of senior photos, well… I was silly, and sent them all in a big envelope to my high school boyfriend after we broke up. At the time, I thought it was clever, but now I fail to understand my line of thinking. The last few days have seen a few hiccups, but here’s to hoping that next week is smoother. I’ve got the Sam Phillips concert tomorrow and John and Hank Green’s library appearance on Tuesday. I was happy to read everyone else’s kicks, but now I’ve got to hustle to get ready to go to Remlinger Farms this morning. Corn mazes, roller coaster rides, Eric Ode in concert– it’s all good. Sara, thanks for the run-down. That series got so many fabulous reviews (and awards, right?). I really need to find it. More than one person lately has enthusiastically recommended the documentary “King of Kong” to me recently, so I need to find that, too. Jone, kick #7 is particularly nice. I used to prefer books and writing over teaching library skills, that’s for sure. LOVE your picture. Beautiful. And what a stylin’ dress. Yes, Sam, I don’t actually own a CD from the Carolina Chocolate Drops, but I went and heard them online and loved what I heard. I know that Maryville College, my (and Eisha’s) alma mater, hosted them last year, too (or maybe it was two years ago). Jama, I sent people home with cupcakes. There were four left, and we finished ’em off last night. Between that and apple crisp and cider, I don’t need ANY MORE SUGAR this week. And, yes, Coldplay rocked it. Whew, that Chris Martin. I was working on something but kept going back to the t.v. to see them perform, and they were generous and let them perform three times. I wish SNL had a link for it, but they don’t. We used to always have squirrel conventions on our bird feeder in our front yard. Ergh. How can I keep them from the birds’ food? Hi, Shadra! What’s your LA drawing trip? Sorry about hiccups-in-days, Alkelda, but it sounds like today will be great — and the rest of your week. Corn mazes — woot! Will pumpkins be involved, too? Well, for a starter kick, I offer a sort of feeble kick-in-reverse. Here I was feeling all depressed at the gorgeous wimmenfolk in every one the senior pix — the ones above as well as the ones linked to — and observing that I was already on a second career by the time most of y’all were emerging into the light, blinking and squawling. Depressed, I tell you. But then I realized I’d overlooked Jone’s link. Hubba hubba and 23 skidoo, and kick #1. Eisha, one note of caution before you head to S. Korea (which sounds like a GREAT trip btw): check Korean-English dictionaries. I noticed you used DANG in all caps. I have no idea what it might mean in Korean, if it means anything, but it gave me a bad premonition — like you might be ordering one of those Mystery Meals your husband experienced. Jules, as always I liked your kicks but was disappointed the only thing you had to report about the party was that you couldn’t post a photo. At least, was your lit-witch a hit? – Coming thiiiissss close to finally getting every expense and purchase and bill payment and deposit for the last 7 months logged into my checking/banking software. Being able to rest my elbow on the desk next to the keyboard — without risking an avalanche of paper… ah, heaven! – Almost (ALMOST) starting to relax about politics. – Finally saw the most recent “Die Hard” (Liive Free or DH) movie. Happily surprised that the franchise still provides laughs, thrills, and — yes — frank and admiring amazement at what Bruce Willis has created in his McClane character. – Perhaps minor in the grand scheme of things, but I got a HUGE kick from posting a blog confession that caused Jules to spray her monitor with coffee. It’s so satisfying (er, as long as it’s not the comedian’s own monitor at risk). JES, yes, I guess my witch was a hit (sorry I don’t have photos — I was the one taking pics all night), and the devastatingly adorable neighbor child, age 4, was also a witch. She was way cuter than I. She always is, actually. Yes, I mean fruit by “raspberries.” Yum. Now I want to make a raspberry torte (sp?) — or, uh, get my husband to, as he’s the better baker. JES, my favorite fun fact about the “Die Hard” movies is that Sam Phillips (who is in the above video and whom folks are probably tired of me talking about)—I think it was the third movie (the one with the mute German terrorist sidekick anyway)—got the role based solely on the cover of this CD. To your last kick I say: Aw shucks. It was a terribly funny story. And I’ve since cleaned my monitor. 1. Being on 7 Imp! 2. Watching a blue jay manage to not only land on the thistle feeder, but contort himself and get seeds! 7. Going to DC this weekend for the Kennedy Center Children’s Book Festival! Those are some gorgeous senior pics! 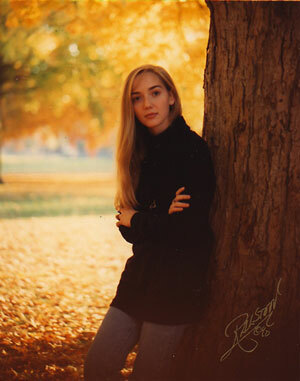 Of course, if I posted MY senior pics, they’d have been portrait photos taken by AARP. Nicole is a lovely woman. I met her at some of the Robert Snow events. Here are my kicks all rolled up into one. Grace Lin and I drove down to Westport, Connecticut, on Thursday for the Rabbit Hill Festival of Literature. Grace was one of the featured children’s illustrators. The others were Steve Jenkins, E. B. Lewis, Barbara McClintock, Mo Willems, and David Wiesner. The festival was fabulous!!! On Thursday evening, I had dinner with the illustrators and festival organizers at Rabbit Hill–Robert Lawson’s house. (Lawson was the only individual to ever win both a Caldecott Medal and a Newbery Medal.) On Friday night, we had dinner at a lovely restaurant. I sat next to Steve Jenkins–lucky me! I truly admire his work. He knows so much about science–one of my passions. I could have talked to him forever. His presentations for both the large audience and small group sessions were wonderful. All the other illustrators did exceptional presentations, too. As one might expect, Mo Willems was a riot. I also had the opportunity to meet children’s poet Patricia Hubbell, who reads my blog–and Leonard Everett Fisher. Fisher was a good friend of one of my favorite children’s poets, Myra Cohn Livingston. Leonard and I sat and chatted about Myra and her work last night. It was such fun attending the festival with Grace. She is one of the finest and most talented people I know. Everyone at the festivel loved her. Now I have to come down from the festival high and get to work on final plans for our fall reading council dinner at which we’re having a panel discussion with Matt Tavares, Wade Zahares, and Daniel J. Mahoney on November 5th. Then it’s off to Keene, New Hampshire, on Friday for the Keene State College Children’s Literature Festival. Ooooh, I never made the connection between that character in the movie and Sam freaking Phillips. (I’m not sure I ever even noticed who played her, although, well, I certainly noticed her per se.) Trust you to know about it, although I can see why people at parties tend to avoid you when they’re waxing elegiac about torn undershirts and explosions and Bonnie Bedelia and you keep wanting to talk about Martinis & Bikinis. I’ve been away this weekend (in York – number one for my list next week!) and thought I’d pop by before going to bed, and can see I’ll have to come back so I can admire everyone’s senior photos! They look pretty fancy for school pics! I’ll quickly say eeeee to South Korea, though, Eisha! So cool – and so soon! I can’t wait to hear about it! Cookies sound like a perfect antidote for a tantrum filled afternoon, Jules! I love seeing everyone’s pics. I suppose I should find one of mine to scan and post. My lack of a scanner is a hindrance. Alkelda, YOU ARE SEEING HANK AND JOHN GREEN? TOGETHER? LIVE? HOW EXCITING! 7. The plans for my homeschooling workshops in CA this winter are finally coming together. I’m feeling unusually sane and organized about the whole thing. It’s nice. Jeremy: Penderwicks and The Sisters Grimm are fun. Wow for the work and the apple juice. Jules: Of course it’s possible! Enjoy Emmet Otter’s Jug-Band Christmas. They are making a Broadway show now. jone: Glad you got to see all three of the grands. Sam: Haven’t heard nor heard of them, but now I want chocolate chips. Jama: I didn’t know that about Jefferson. Wave to the squirrels for me, please! eisha: I don’t have them. My yearbooks are in storage hundreds of miles away. Nicole: The first line of How I Found the Perfect Dress by Maryrose Wood is: “Tinker Bell pajamas!” 🙂 I love Tink too. After spending a couple hours writing about Sudan, Nicole’s art really cheered me up. It was just what I needed! Thanks! What fun to see senior pictures! Jone, yours are the best! I wish I could post a senior pic, but our scanner isn’t set up. My most telling sennior pic: blond hair (curling ironed into having some body– to please Mom) under a black hat and my school newspaper staff shirt. The hat screams Debbie Gibson, although I can’t explain how that happened, since I’d given her up in favor of punk in 9th grade. By the end of senior year, my hair was wrecked from always being twisted up and pinned through with a pencil– not that I was worried about having nice hair. #1 The leaves in our neighborhood have been brilliant in so many colors I can only begin to list: still a variety of greens, golden yellow to orange, bright red to eggplant. #2 I up-dated the “Crash Course on Sudan” that I wrote for a couple friends earlier this year, and then I posted it on my blog: http://blog.myspace.com/index.cfm?fuseaction=blog.view&friendID=409708516&blogID=444027036. #4 Living close to my husband’s parents is wonderful in so many ways. They brought dinner over one night last week. So nice! Before dinner, my 5-year-old brought out his astronaut costume in-the-making and we did some troubleshooting on it together. Now his space-pack is done! Yay for putting our heads together! #5 The boys have been cracking me up all week by starting every other conversation with, “Do you know what i am going to be for Halloween next year?” Since they already have costumes in process for this year, they are obssessed with coming up with ideas for next year. I can’t keep track, but a few they’ve come up with are a big, scary monster; a pencil building (like the ones in downtown Pittsburgh); and a DJ. #6 I’ve been suffering from laundry-folder’s burnout, and my husband has picked up my slack– just one of those mundane things that reminds me to appreciate my husband. #7 I’m a little sick, and Seven-Imp brightened my day. Nicole, the festival sounds wonderful. Who was there this year? I have been to just one of those — during the short, short time I lived in D.C.
Elaine, JUMP BACK! You really saw some very talented people there. I’m very, very jealous. I hope the fall reading council dinner goes well. Please do report again. JES, *I* would be the one at a party trying to avoid people, as Wallflower is my middle name at a party with people I don’t know. And, yes, what a weird thing she was in that movie, especially since she has such a fabulous voice and played a mute character in the movie. Emmaco, glad you had a good trip. Adrienne, I thought I was full after a very yummy dinner, but your list made me hungry again….and I’d LOVE to see your senior pic. Surely there’s a scanner at your liberrrrry?? Glad your workshop planning is going very well. Little Willow, deal. I’ll try it one week. Shadra, if you ever get tired of having to buy “tall” pants, you can donate a couple of vertebrae to me. Although I’m on the other end of the spectrum, I totally get the thrill of finding pants that actually fit. Alkelda, dang, you have the coolest couple of days planned ever. I would love to see either Sam Phillips (again) or the Bros. Green (for the first time). JEALOUS. I’m also curious about your reasoning for sending all your pics, but then I remember an incident in high school where I took all my ex’s photos and cut them up into pieces, which I left in a pile on my bedroom floor for weeks. It’s a difficult age. JES, good point – I’m going to have to watch my slang. And yeah, baby, Jone is a hottie. Nicole, I love both apple compote and Babylon 5. We should hang out IRL. Elaine, you stop it with the AARP jokes! And how do you get to go to such amazing events? That’s just entirely too much talent crammed into one evening. Thanks, Kelly. Um… where’s yours? emmaco, it’s sort of a tradition here, I guess, that for senior year of high school we (i.e. our parents) pay for fancy professional photos. I can’t explain it, any more than I can explain high school rings. But I’m so glad the challenge wasn’t to post prom pictures. adrienne, your week sounds so delicious. And your inner nerd and outer awesome are both welcome to come visit me at work any time. Little Willow – how very convenient. Humph. Kathe (and eisha), looks like we were posting at the same time. So glad to hear we brightened your day, Kathe. And my children do #5, too. I love the DJ choice, by the way. That’s pretty great. I also hate folding laundry and have entirely too much of it to do, it feels like, but then I can’t complain, ’cause I rarely actually wash. The husband does. Wow! I love the illustrations, and the warm family feeling of them. And the duck is too cute. Ladies, you are all smokin’ in those photos! I don’t have a scanner either, and I don’t have any of my senior pics, but I may have an old photo from a dance around somewhere – I’ll look and if I find it throw it up over in my little corner. Sara – CONGRATS to your daughter! I really hope she gets to go to Paris too. Jules – congrats on the successful Halloween party – and the cookies! Eisha – So happy your husband made it home safely, and that is so cool you get to go too next time! 1. I voted. Dropped my ballot off Saturday morning. We primarily want to be dog walkers and dog runners, and its exciting getting started. 3. My dog Chey committed a roast-napping Saturday morning, which probably shouldn’t be a kick (I blogged about it.) But it does remind how damn smart she is, and it was funny to me. 4. I scored a killer pair of black Charles David boots on Friday, for less 1/4 of the original price! And then wore them to a big deal work cocktail party Friday. I went sans BF, (he gets bored, lawyers tend to talk shop) and it was fun to socialize without guilt, and then I got to go home and have dinner with him. Win-win! 5. Reading Stephanie Meyer’s New Moon on Saturday afternoon while sitting in the backyard in the glorious fall sunshine. Plus, all Dave’s breads are awesome, and he has a great story! 7. Getting a friend’s family recipe for molasses cookies and baking them Saturday – and they came out sooo good! Thank you so much for mentioning the interview I was fortunate to do with Nicole. She’s such an amazing illustrator and I’m so glad to see that others appreciate her work! What a great blog! Such a kick to read about Nicole on your blog! When I share Fatuma’s New Cloth during school visits, the students’ responses to the art are both visible and audible. Her characters are so loving and real–all people I wish were in my own family! Hi, Lori and Leslie. Our pleasure to feature Nicole. I’m late this week because our computer is apparently riddled with viruses and being treated as we speak. I feel so out of it because I didn’t go near a computer from 3pm until 8am this morning. And I can’t participate in the senior picture sharing because we don’t do that kind of thing in England. And we don’t have proms or graduation ceremonies either. We don’t even call it graduation, just “leaving school” – no rite of passage over there. So, if you want to see my picture, I give Jules permission to post the pic from the party because you’ll probably be distracted by Ruby as she attempts to devour a plastic snack box. Jules – I only saw the first Coldplay performance, and it occured to me that I had never seen them live before. Chris Martin is a madman when he sings, which is such a contrast to how shy he is when being interviewed. I loved it. Eisha – S. Korea!!!!! You lucky thing. And we are so getting a Mac laptop when our computer dies. Jone – I’m shopping around for new appliances too. We really need an oven and refrigerator that works properly if we want to host a successful Xmas this year. 1 – The party. We had so much fun, and Jules was an awesome witch, scary green fingernails and all. 2 – I met Spiderman, Superman, a pirate, a witch (who was not Jules), a princess and Dorothy (who was blond), as well as a baby dressed as his daddy at the party. So much cuteness. 3 – Homemade apple crisp – YUM! 4 – No more fleas!!!! 5 – Cy has a new favorite song, “Sweet Revenge” by John Prine. He has spent the past 12 hours singing the first verse and chorus over and over. It’s very funny. 6 – We paid $2.27 per gallon to fill up our car on Friday, and the next day, it had gone down to $2.19. I love being able to fill up the car for less than $35 (that’s about the only positive thing to come out of this crappy economic crisis). 7 – I found a firefighter costume for Cy and it cost less than $10, and he loves it. When he wears it, he is “the coolest firefighter in the world”, and I happen to agree (apologies to my brother David who is a real and for true fireman in London). We’ll see how the violin experiment goes. So far, it’s fun, and a neat thing that Ivy and I can do together. Piano would be great too — probably easier to get started on for littler kids. I just finished the first book in The Sisters Grimm. It’s fun, well written and the infrequent illustrations are excellent. If you like fairy tales, you’d LOVE this, as it’s jam-packed with fairy-tale references. It felt a bit like Spiderwicks, which isn’t a bad thing. I’ll read the next one before passing judgment on the whole series. It was a bit too scary for my girls, unfortunately. Sorry, I wish I had more tidy, easy music recommendations. I guess I’ve been listening to a fair bit of The National (video here), but I think everyone’s already listening to them. I’ve been spending more time seeking out songs online, going through the music blogs and indie label sites to find diamonds in the rough. Then I do some digging on the bands I liked and find that Great Lake Swimmers have a great page on CBC Radio 3 (our Canadian national broadcaster site) where you can “play all tracks” to hear a whole bunch, which makes a nice soundtrack for working online. That might lead me to another one from that site, a great band called Wintersleep that I’ve been listening to a lot, especially their latest album (video here). It’s a hobby, I guess…fun, but it takes a lot of time that I can only really carve out of (or layer over) work time. Allright, then. With permission, I introduce: ZOE!! And punkin’ head Ruby!! Zoe, sorry abour your computer woes. And that Cy … you know, his musical tastes just keep getting better and better. Glad you all made it home safely. Jeremy, WHOA! Many thanks for the linky goodness. And, no, I’ve never heard of The National. I’m going to explore these links later, as I should be, ahem, working now (you can see how well that’s going)…I’ll listen a bit later, and my goodness, thanks for taking the time to share those links! It’s much appreciated. I need some new music in a big way, and I trust your musical sensibilities. Oh, and I’m gonna check out The Sisters Grimm, too. Thanks! Jules: There’s going to be a lot of folks there! Bryan Collier, Nikki Giovanni, Carole Boston Weatherford, and more. http://www.kennedy-center.org/programs/specialevents/bookfestival/. It’s this Saturday 12-6 at the Kennedy Center. Thanks for rescuing my kicks, Jules! Such a cute pic of Zoe and Ruby! The roast mess was not too bad, took 10 minutes to clean. The hard part was not laughing out loud while cleaning. I met Dave once at the Farmer’s Market, but don’t remember what his tattoo was of – I was distracted by all his yummy healthy bread. And I would go to your bread/book store in a heartbeat – it sounds like heaven!